I’m so glad I decided to see if there were any new posting on your blog. I’ve been thinking about seafood and champagne for our Valentine’s Day dinner. Although I agree with you that oysters are best tasted raw on the half-shell, my husband prefers them cooked. 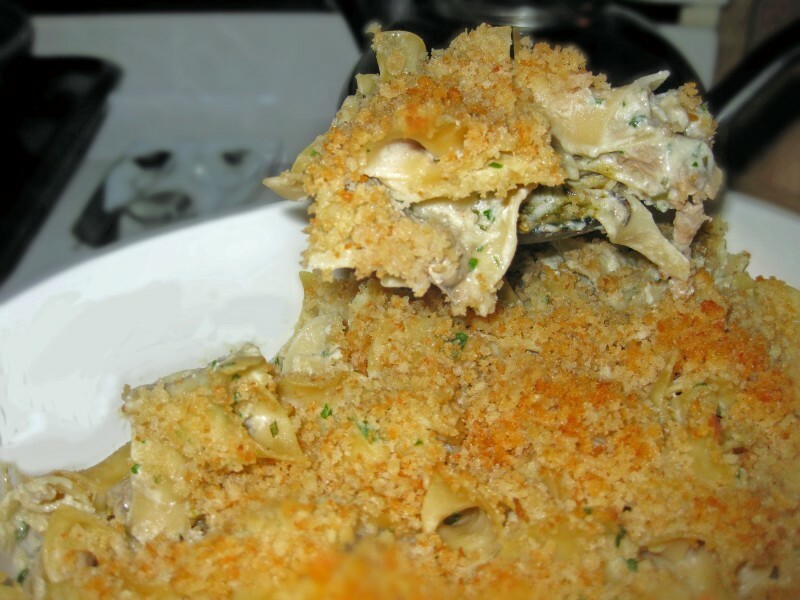 Oyster casserole sounds like a perfect main course for a romantic dinner. I’m sorry I took so long to reply. What a fantastic dish. It’s definitely one I’m keeping in my recipe collection. Thanks for sharing. I posted a comment about Paula’s cookbooks on the Chowhound site and mentioned your blog. Several people have replied asking for a link to your site, which I’m going to go there to post right now. My husband’s been out of town on business for a few days. I’m baking a batch of the brownies as a “welcome home” surprise. Thanks Madonna – I’m so glad you enjoyed this casserole. It’s one of my favorites of the unpublished recipes so far. Definitely appreciate the Chowhound mention- thank you! The brownies are classic – I plan to post them soon. Hope your husband enjoyed them! WOW this was AWESOME!!!! I started to make Tuna Noodle Casserole and had no tuna but found a couple of cans of canned oysters. (I’m sure fresh would really make it extra special). Tried to follow the directions as close as possible and couldn’t believe the taste! This is a keeper and I just wanted to thank you for putting it here for me to find. Your grandmother must of been a fabulous cook. Can’t wait to try more of her recipes! Thanks Lana, so glad you enjoyed it! It’s one of my favs.